No one ever told me that hands become gnarly after too much time in the sun. My hands are as gnarly as the bark on an old oak tree. But, at least they’re sun-kissed – the color of a beige antique car. My hands soar when a story strives to alight from my funny, surprising brain, a brain that is awash with jangled memories and silly jokes, serious worries and spurts of light-filled love. Isn’t it interesting, how our brain (with some help from our nerves) can cause us gloom as dark as a tunnel, or light brighter than a star? As the words sprint from my knotted brain through gnarly hands to white-lined paper, a kind of spirituality occurs. Yes, I see the spirit of me, and you, and all of us, dance and wiggle in front of me. As a teenager would say, that’s really gnarly. As an atheist would say, what’s spirit got to do with it? As a humanist would say, the spirit surrounds those whose eyes are open wide. As a writer would say, the spirit speaks through our words. I wrote this for a 5-minute creative writing prompt with instructions to use the following words: spiritual gnarly soar sprint antique. Photo by gnarly me on an early morning walk. There’s immense power in words. The right ones just need teasing out from the imagination and be given flight – but once out there … wow. And sometimes a writing exercise gives you words you didn’t ask for, but still, they are the right words. Amazing! Love ity! I might take those words too. I love the treasure hunt in it all. Thank you! Writing a story with the right words is a type of treasure hunt, isn’t it? I love this way of looking at a story… thanks. Hmmm, the hand is not that gnarly to me. :-) And neither was the writing! I think your hand looks quite beautiful, Pam. Just think of all you’ve given with it. I surely hope so, Paula. That’s my endeavor. Thanks so much for reading my spirit, as I enjoy reading yours. Beautiful sunrise and hand, Pam. Both give the world joy in different ways. Your hands are only junior gnarly compared to mine- but the words still flow through them onto the page. Yours are a beautiful example of spirit > mind > hands > words> paper! May the spirit continue to speak through our words, line by line, hook by hook. A lifetime of stories and counting… Here’s to many more in your life and mine. What would you write about hands if you spent a few hours at it? This is magnificent! Your blog speaks to our spirits weekly. Thank you! What an unlikely group of words to use together – makes me think of that cooking show on TV that my husband likes, Chopped. The cooks are challenged to prepare a palatable dish out of odd assortments of ingredients. Loved your comments here. Great similarity between combining different (odd) ingredients to make a delicious dish, and combining odd words to create a story. In fact, I think I’ll write about baking in my next post. 🙂 What sweet sweet memories you have of your grandmother. Yes, our hands are gnarly but they still have stories to tell and things to do. Stories to tell, things to do, and good food to create. Keep at it, my friend!! Your hand in the photo looks strong and capable. 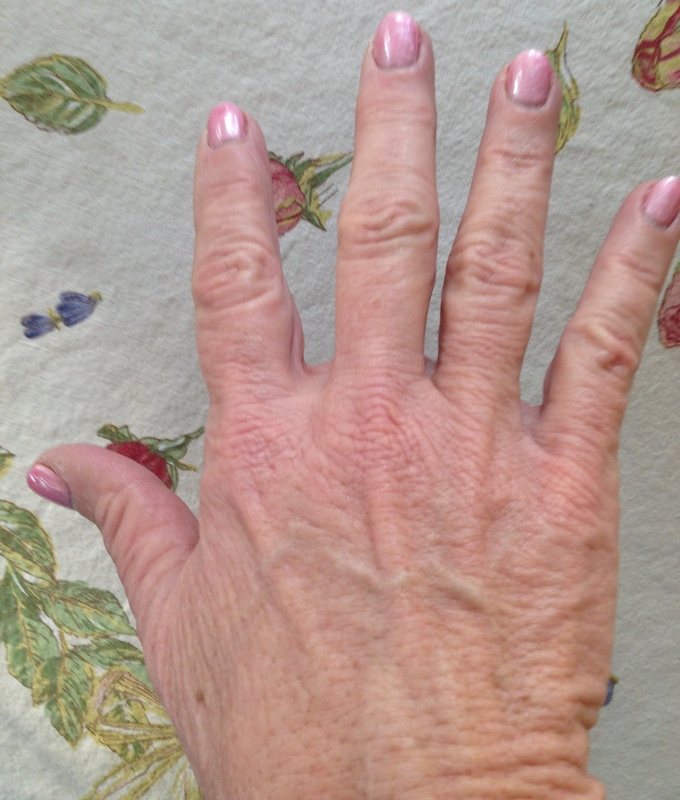 The subtle pink nail polish is a perfect contrast to your seasoned tan. Hands often offer wonderful gifts. I have magic fingers, so I’ve been told. Putting ‘gnarly’ in that list was a challenge but you met it beautifully. They don’t look all that gnarly to me but it’s not what they look like but what they do that’s important and I think you’ve got that nailed. Pamela – you got a whole lot out in a short period of time. Well done! All through quick and nimble movement on the keypad with your healthy hands and fingers. Double takes on hands on the wheel? I know the feeling. Ho boy, I’m glad I’m not the only one who has done a double take on my own hands. It’s pretty funny, except for the fright of realizing how hard we’ve worked to get our hands to look like that. !! You always have such a great way of expressing things, Dave. Yes, spirit is what makes us humans. And thank goodness for that. Funny how uncomfortable some are at expressing the idea of spirit. I think we all should embrace and explore our spirits as much as possible. Gnarly hands — that’s for sure! All that hand washing, plus I use my fingernails to pry open things, so even my nails are hardworn. But put to good use! Meh. Hands are what they are. You are defined by your soaring spirituality. I LOVE THIS! Talk about an oxymoron – Army men posing in yogic down dog, tree and (of course) Warrior. I truly believe that if the military of all countries insisted on yoga every day, there would be less wars. Thanks for making my spirit soar today. Hugs. I knew you’d love it! Next year we need to put together a Blog Pal Secret Santa. Now that is a fabulous idea!! Oh yeahhhhhhhhhh, I get the picture. But hey, I think our spirits just get younger and younger!!! That seems to be the way I’m trending! Merry Christmas my friend! I hope it’s a wonderful season for you!